This show wont be winning any great drama show of the year awards, but its definitely a fun show to watch. Think something along the lines of Gintama-lite. Its a nice, light, humorous show with some nice action scenes. Good Que filler while waiting for your favorite simulcast to be available. I think it succeeds at being what it is trying to be. A fun, fast paced, silly action show. Unlike Gintama there's definitely an overall plot being followed and a deeper story line to be seen, the lack of which turned some people off of Gintama. At first I was a little turned off by the unusual mix of themes, but I learned to laugh at it and it grew on me. Drawn in by the familiar Lupin the 3rd art-style, I expected it to be something similar in a different setting. The unusual set of characters, the lazy yet go-getter attitude, and the less than savory occupation was all there... on top of Ranger suits, zombies and the occasional psuedo-mecha?! It's bewildering at first, but they put together a story with plenty of interesting turns and just enough cliches to hold your focus without leaving you too confused. There's absolutely nothing else like this, but I'm not sure the world needed it. At least characters were good without loads of build up. Short, silly, and strange, I'm glad I finished it, but the story left a lot to be desired. This is one of those animes where I really wanted more the series than it gave me. It had some potential, but I still feel like something is missing. I liked the characters, I liked some of the storylines but I think it was lacking a cohesiveness that really brought everything together. Some elements just felt tacked on, particularly in the ending (I'm all for absolute ridiculousness but not in the way they did that). At the very least, they could have balanced the tone a bit better as the ridiculous elements didn't really line up with the more serious aspects. I would have liked more exploration into the side characters as well, particularly Magoichi, and his story is one of the ones that could have tied in more with the plot as a whole. While it does at the start, by the end he's become this odd outlier who never really receives a proper conclusion. Animation-wise it's pretty well animated, with bright colours and a style that fits the show. The soundtrack is nothing to write home about, but suitable (minus one track towards the end). Overall, this is one of those series where if you have something else you want to watch, you're probably better off watching it. 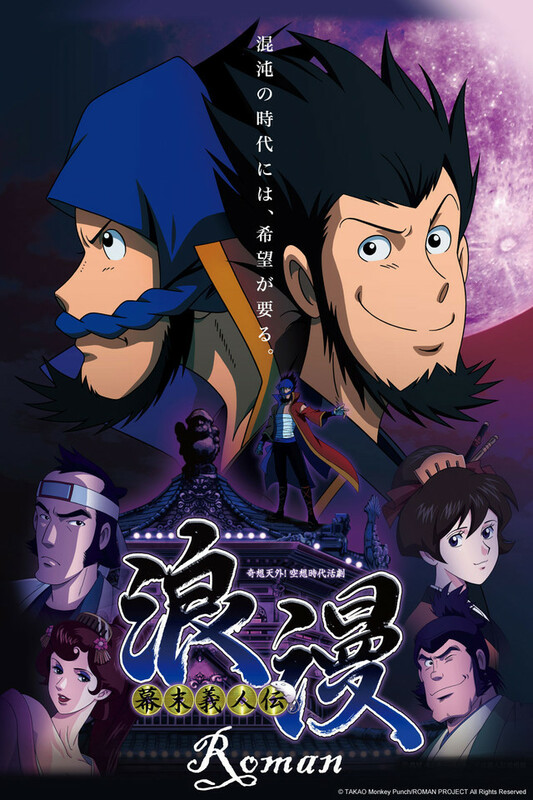 While Bakumatsu Gijinden Roman is not a terrible series, there are better anime out there. I just freaking love it :3. The anime is great and fun. I don't know why the people compare it in a literal way to Lupin. It follow the main stile of Lupin but only in a different way. The anime it self has a good story and art. In the story theres allot of WTF moments but is worth it. In the end i just really like it and hopping that they do another season !!! Oh and yea The Miko girl is my GF lol. In summary, I like watching this. The characters are interesting,.. though not entirely original... the plots still interest me more than a lot of other shows around these days. I like how simple everything is... it is nice and light and still fun to watch. But please disregard everything I said if you simply do not like any cartoons that don't look like Bleach,... and you are not looking for "Bleach" style artwork where the characters fall in love with their swords or something, dies and then come back more powerful with more flowing hair and clothes.... I repeat... so far the male characters are not more feminine than the women in appearance and their swords have not turned into people to fall in love with them. I am not really a fan of the weird technologies and zombies... it is like filling in potential plot holes with whatever is popular... but so far I can live with it. I'd watch more.